If I were to ask you, "What subject matter in school is deemed most important?" What would your answer be? Math, science or art? Art? Doing this for a living was never even an option in my household -- it was a taboo subject. "Be a doctor, lawyer or engineer," my parents would ingrain in my brain. In my parents' eyes, the definition of success were those professions, in that order: doctor, lawyer, then engineer. I chose the fourth - failure (in the eyes of my immigrant parents, journalism seemed like failure). Reading and writing, my passions, were not as revered as mathematics and science. I would read everything out loud. In the shower, I would read shampoo bottles - "Rinse, lather, repeat." I remember what brought me joy was acting out the characters while reading my favorite childhood books. It's no coincidence that I became a journalist, founder of Go Inspire Go (we use the art of storytelling to inspire action) and college instructor. That's why this GIG Spark, produced by high school student Aaron Long resonated with me on many levels, personally, professionally and even spiritually. Through Aaron's GIG Spark, he wants to inspire us to look around and enjoy the art around us in San Francisco. Don't live there? No problem; Aaron wants you to look around and enjoy a tree, some street art or something that catches your eye. How did he do this? In a creative way, of course! Find out how he inspired folks in his community to be present and enjoy the art around them through this GIG Spark (Lesson on Compassion) submission. His goal is to inspire you to notice (and enjoy) the art that surrounds you. Like many GIG Spark videos, this seems fun on the surface and it is. But on a deeper level, being creative isn't nurtured in our society. I recently discovered this TED talk by Sir Ken Robinson, an internationally recognized leader in the development of education, creativity and innovation. Specifically, he speaks about the importance of creating an educational system that nurtures creativity. This TED video is full of inspirational gems. I often wonder what I would be doing had I not pursued my passion work. One thing's for sure - if I hadn't, I wouldn't be as fulfilled and full of joy. Special thanks to Aaron for being aware and inspiring presence in this adventure we call life. 1. Stop wherever you are. Look around and take a deep breath. Enjoy one thing around you. 2. Get creative. Like to bake or paint? Do it, then give it away to someone in need. Small things like this make anyone's day. 3. Nurture the artistic talents in a child's life. We hope this video inspires you to be present and enjoy the art around you -- and use your power to help others. I've been practicing enjoying the art around me by taking pictures on my Go Inspire Go Instagram account. I always snap cool scenes and things that inspire me because I want to share it with our viewers (tagged with an inspirational message). Note: Thanks to Mom: who turned over a new leaf and supports endeavors -- because she feels my passion for GIG. Also, I know (and feel) that my father, who on his death bed told me, "You're wasting your life, you need to quit that reporting stuff and become a doctor," has had a change of heart and is somewhere above, looking down and smiling at me. Smiling because I followed my heart and chose to redefine his definition of "failure." Thanks to my parents for taking the risk -- to uproot their successful lives -- so my siblings and I could redefine the American Dream. No. 4 ain't so bad! GIG Spark was developed to create compassion through the exercise of brainstorming, problem solving and experiencing the joy of using your power to help others. Rachel shares her thoughts about what this particular experience meant to her: "Something GIG Spark taught me? Don't stop yourself from doing something just because you think it's not going to change anything. Whether what you do is monumental or small, whether it affects a million people or just one person, what's important is that you did something. It's human nature to resist change, but at least you presented a chance to plant a seed of change in someone's mind." 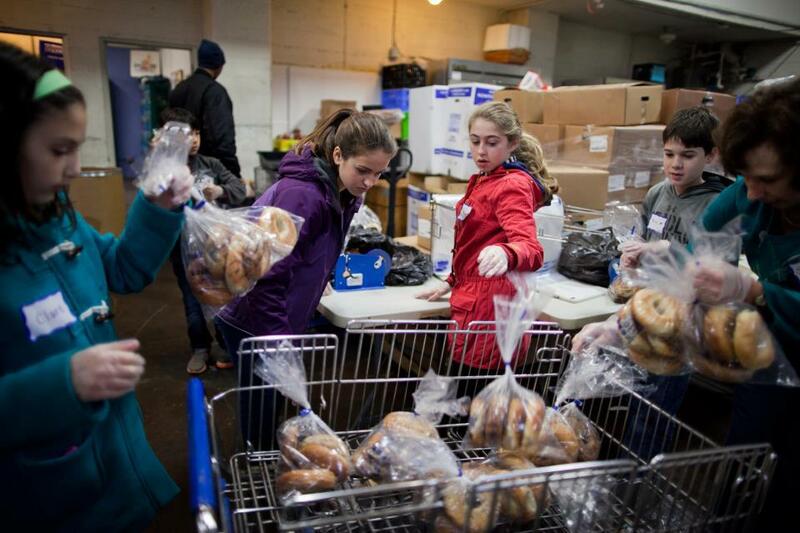 Young volunteers package bagels to give to those in need. When a new year comes along, many of us make resolutions, such as to eat better, lose weight, or spend less time in front of televisions and computers. For some, it’s about making a commitment to give back to their communities and support causes they are passionate about through volunteering. You may be thinking, "I don't have time," or, "I don't know where to start." With this Social Good Spotlight, we've made it easier by listing some of our favorite organizations that can help you connect with nonprofits and find the right volunteer opportunity, one that fits your interests and schedule. So here's to making a New Year's resolution to give back - you might find it's the best gift you can give yourself. 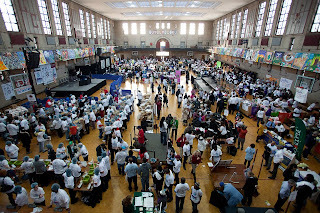 VolunteerMatch is the largest volunteer engagement network on the internet, with more than 90,000 participating nonprofits, 160 network partners and 10 million visitors each year. You can search for local volunteer opportunities as well as virtual ones (opportunities that can be done from anywhere, at any time, and not all necessarily require a computer). HandsOn Network is the largest network of local volunteer centers around the world with 250 HandsOn Volunteer Action Centers. In addition to skills-based opportunities in your community, the website makes it easy to find ways to contribute to disaster relief efforts, as well as learn about full-time volunteer opportunities through AmeriCorps National Direct and VISTA programs as part of the HandsOn Corps. Each year, HandsOn Network and other national service partners organize and promote a national day of service and dialogue to honor the memory of Dr. King on the Martin Luther King Jr. holiday (click here and go to the “Find a Project” section to learn about volunteer opportunities this Jan. 21, 2013). Idealist connects people, organizations, and resources to “help build a world where all people can live free and dignified lives.” In addition to volunteer opportunities, you can also find internships and job opportunities in the nonprofit sector. Craigslist is a local classifieds and forums with more than 700 local sites in 70 countries. While most people use craigslist to find jobs/housing and buy/sell stuff, the website also offers volunteer and nonprofit job postings. GreatNonprofits aims “to inspire and inform donors and volunteers, enable nonprofits to show their impact, and promote greater feedback and transparency.” Similar to Yelp, Tripadvisor or Epinions, the website contains reviews and ratings posted by people who have been impacted by a nonprofit and want to share their story about it (typically volunteers and clients of the nonprofit). The following resources specialize in microvolunteering, a relatively new way to volunteer for people who can’t commit a lot of time and prefer short-term assignments through the web. Examples of microvolunteer actions include participating in online brainstorming sessions for fundraising event ideas to creating logos for a newsletter to conducting online research to add names to a distribution list. Sparked offers a “platform that delivers on the promise of Social Business.” Using its Sparked Community product, Sparked promotes microvolunteer opportunities that provide professional expertise to a global network of nonprofits. 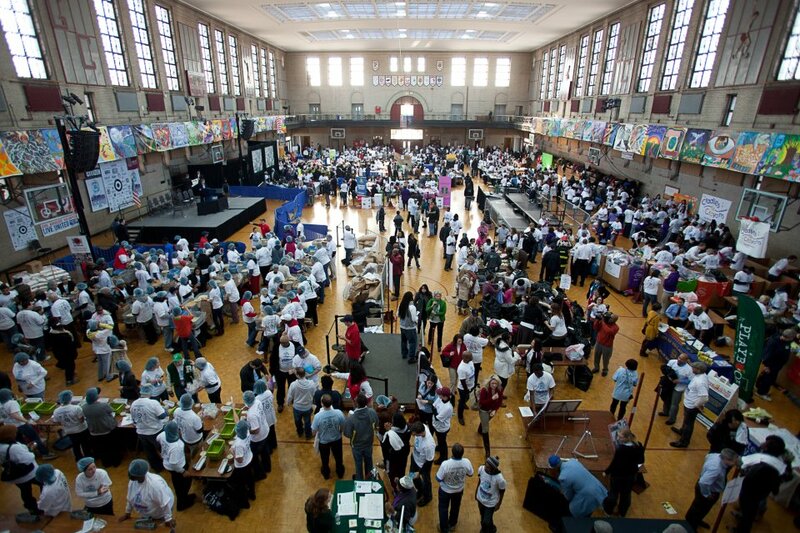 Over 70,000 volunteers and 6,500 nonprofits have used Sparked to connect and exchange ideas and resources. While many of its volunteers come through corporations with social responsibility/employee volunteerism programs, anyone can sign up to microvolunteer. You must register to see postings by nonprofits seeking help. Help From Home is a community website that promotes and encourages participation in easy, no commitment microvolunteering opportunities. A United Kingdom-based service, many of the listings on the website are for opportunities to engage with nonprofits located in countries around the world. I've never really made New Year's resolutions. But last year, I resolved to do one thing that changed me (from the inside out) every day of 2012. I finally got around to keeping a journal -- why did I wait so long?! It's not just one of these woo woo journals for the sake of saying you keep a journal. Instead of a sole gratitude journal, I started an evidence/gratitude journal -- inspired by two people, one of whom I know, another who I will know or at least meet one day: Devyn Rush and Oprah Winfrey. I've always been a fan of Oprah and have always kept her crusade to inspire folks to keep a gratitude journal in the back of my mind. It sat on the back burner until December 19th of 2011 -- that's when I finally lit the flame. An inferno of miracles ensued. I always thought, why keep a journal? I am present now, enjoying the now already. Well, what I realized is that this is where the magic happens -- when you actually put them down on paper, effervescence happens… your thoughts manifest into something tangible, something real. My friend Devyn Rush, a former American Idol contestant who is also a national spokesperson for U.G.L.Y., a bully prevention organization, told me about this journal, "Building the Best You." If you get the privilege to know Devyn, you will walk away feeling reenergized by her infectious positive energy. At her behest, I decided to finally put pen to paper and took the penning plunge promise. My goal was to write in it everyday -- I knew this would be a big feat for me because I get bored easily -- but I'm proud to say I did it. Woo hoo. And whoa! Wee. Wow. This viscerally changed me from the inside out. What's the difference between a gratitude journal and an evidence journal? The evidence part is when you log what you did for the day -- then the gratitude part is when you write down things that unfolded that you're grateful for. 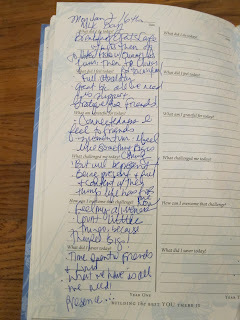 Everyday I wrote down what I did that day, then at least five things that I was grateful for. The Building the Best You journal is a two year journal, each page is split in half. The left fold is year one, the right fold, year two. I remember Oprah saying, "Some days I'd be grateful for seeing a squirrel in the park." And boy wasn't that the truth. She's right, it doesn't matter how simple something seemed or the lack of things you felt grateful for, it's the fact that you've put this gratitude exercise into practice. And like a muscle that is put into action, I've become more aware and conscious of the beauty surrounding my life everyday. My favorite author, Eckhart Tolle, calls this "awareness." No matter how bad my day was, I found myself grateful for the lessons that came in different ways, shapes and forms. I started searching for things that I was grateful for during my days: a phone call from a loved one, discovering yet another street-corner style hero to feature in my nonprofit, Go Inspire Go, or a walk with a friend along the pier. It became habit. I randomly flipped through my journal a couple of nights ago and was happy to see that I was grateful for "being present" and "my breath" and feeling connected to something bigger than myself were constant themes. What a big accomplishment. 1. Being more present than ever before: to nature, people and my spirit -- not the "ego" or "thinking thing" rather, what Tolle calls "the watcher" -- my inner compass. 2. Connections to people. I felt like the Universe sent me personal and professional connections that continue to help me grow as a person as well as progress within my nonprofit, Go Inspire Go. 3. Realization that when you become present and surrender to the ebb and flow of life, you are open to receiving more. Gratitude begets more goodness (and things to be grateful for). What I've realized is that the miracles have always been there; I just became aware that they were happening -- which in turn created and ignited more miracles. That's the law of attraction at work. Ever notice how when you start the day by saying, "This is going to be a bad or stressful day" -- the universe delivers a "Terrible, horrible, no good, very bad day?" What about those days when you say, "It's going to be a great day!" As a kid, I always woke up thinking, "What will I learn today? Who will I meet? What will happen?" Now I go to sleep logging the days happenings, building awareness and counting my blessings. In a sense, keeping this journal brought back the child within and has taught me to unlearn certain things we've learned as adults and to go back to that innocent, creative, awe-filled child's lens we all had when we were discovering the world as children. I'm glad I finally took action to count the miracles and enjoy them fully -- I've evolved physically, mentally and spiritually thanks to the simple five-minute exercise of keeping an evidence/gratitude journal. Are you aware of the miracles showing up in your life everyday? Write them down and witness them multiply. My favorite author Eckhart Tolle says that the universe conspires to help us all. "But if the shutters are closed the sunlight can not come in." Cheers to a new year of counting your blessings and logging the light that comes through your window. Happy New Year -- Happy New You. P.S. What can YOU do?